Lets face it – Avengers: Age of Ultron was disappointing. It was good. It was great really but it should have been amazing. The Avengers movies are the ones that all Marvel fans wait for. The rest of Marvel’s cinematic universe is supposed to build to these events and although it had some great moments – Age of Ultron was not the end of phase 2 that we wanted. 1. It was too similar to the first movie. Avengers assemble, are broken and then rejoin to face hordes of faceless, CGI non-humans that can be dispatched in creative ways with no fear of killing anyone. 2. The new Avengers were under-used. Scarlet Witch and Quicksilver were great but didn’t have the desired impact new superheroes should. They will be a bigger part of the whole series I’m sure but they are the new addition – the film should be theirs! 3. Nothing actually changed! Captain America 2 brought down SHIELD and re-introduced HYDRA into the modern Marvel universe. This impacted upon his own films and then the SHIELD tv show. Guardians of the Galaxy showed that the Marvel universe extends beyond Earth and Iron Man 3 – well it gave us Don Cheadle as War Machine. What I’m trying to say is that each film seemed to move the collected universe on. Nothing major changes after Age of Ultron. We get a few new characters and the ending teases something new but nothing particularly earth-shattering and considering this was the movie all others should build to – it was an anti-climax. That is where Captain America 3: Civil War should change things. For those unfamiliar with the overall story; a superhero related incident ends in civilian casualties calling for the American government to believe that superheroes should be more accountable. This results in all superheroes registering their identities with the government – a program that Tony Stark/Iron Man agrees with. Completely opposed to the idea is Captain America. We get two sides of a controversial argument and all superheroes are forced to choose their side. Good guys vs Good guys: Civil War! It also means that we need superheroes. Lots of them. Black Widow, Hulk, Thor and the newest additions in Scarlet Witch, Falcon and War Machine won’t cut it. This is all superheroes being hunted to register with the government. This could potentially involve the new Daredevil (and then also Jessica Jones and Nick Cage if their show is released in time). We have already had confirmation that Black Panther (played by Chadwick Boseman) and Paul Rudd’s Ant-Man are in it but everyone and their Mother knows Spiderman will make an appearance too. A superhero dividing story and brand-new characters involved in an event that will change things in the Marvel universe – sure feels like the movie that Avengers 2 should have been. 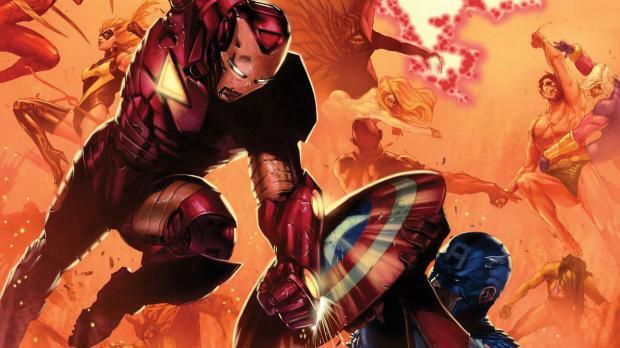 I’m not entirely sure why you wouldn’t have swapped Captain America 3 and Avengers around – have Cap fight Ultron and then make Avengers: Civil War. Imagine this poster in your local cinema! Considering that Captain America: The Winter Soldier is so far my favourite Marvel Cinematic Universe movie; I have huge hopes for Civil War. The same directors that gave us Winter Soldier, Anthony and Joe Russo, are also delivering this pivotal story and to add more hope to the proceedings – they will also be the directors for the next Avengers movie(s) The Infinity Wars. Overall, I’m really excited for Civil War. Considering Batman will take on Superman on the big screen next year, this is still my most anticipated film of 2016. Avengers: Age of Ultron was good but Civil War will bring a Universe changing story, introduce new, key characters and pit together the daddies of the Avengers: Iron Man vs Captain America! This is what Avengers should have been! 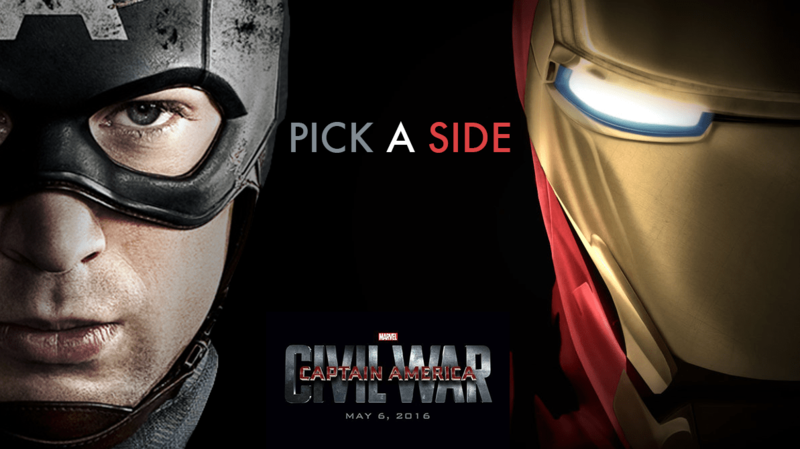 Captain America vs Iron Man – the only superhero battle that matters next year! I got chills from the Spider-Man poster with Captain America on one side and Iron Man on the other. Chills! I can’t wait until it comes out! That would be an amazing poster. Can’t see them broadcasting his involvement in the movie so blatantly though. Would be much better than just throwing loads of character posters up though. That’s a great poster. It’s funny as I think a lot of folks were much more interested after the news dropped of Civil War than they were for Ultron. At least we don’t have to wait three years for another Avengers epic. That’s true. This one should live up to the expectations I had for Ultron too.